Located on the 3rd Floor Residence Commons, the caf is an all-you-care-to-eat facility featuring 14 unique stations that offer a wide variety of food choices to our students. Many of the stations are set up to allow our team of highly trained Chefs to prepare food right in front of your eyes! the caf offers a wide variety of meals that rotate on a regular basis. These meals can range from Roasted Pork Tenderloin, Asian Stir Fry’s, and Local Ontario sourced meals, to Curry Fried Rice and Japanese Eggplant. the caf also caters to a wide variety of dietary needs. Just let us know as we are able to cater to your diet whether you’re lactose intolerant, vegetarian, celiac or any other restrictions and preferences you may have. The Caf does not use any peanut or tree nuts in our recipes and we do not purchase food products with peanuts or tree nuts in the ingredient list. There is always a risk of outside cross contamination so we advise our guests with severe allergies let us know about their concerns. If you’re a first year student you will want to check out our Residence Meal Plan page. Not living on campus this year? Save up to 15% off your food with our Off Campus Meal Plans. Located in the caf, the Gluten-Free Pantry offers Carleton University students a stress-free dining experience. This is the first gluten-free space of its kind in Canada! For more information on our gluten free pantry page for more details. We are proud to announce that our dining hall The Caf has earned the first 3 star SPE Certification at a Canadian university! 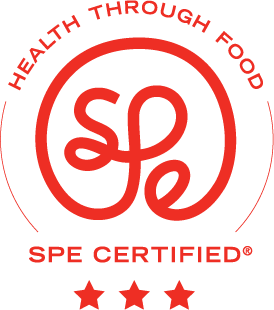 SPE Certified stands for Sanitas per Escam, or “Health Through Food” in Latin. This unique third-party certification recognizes the commitment of Carleton Dining Services to nutrition, sustainability and to our customer’s well-being! SPE’s seal of approval reassures students, faculty and staff at Carleton that meals are created while considering sustainable sourcing of ingredients, healthy culinary techniques, and balanced menu options. Just like Fair Trade Certification is for coffee and LEED Certification is for buildings, SPE certification is for food. Learn more! Do you have a suggestion for a dish we could serve in the caf? Tell us through our Raven’s Choice program!